He had been suffering from lung cancer for the last couple of years. He soldiered on remarkably through his treatment. 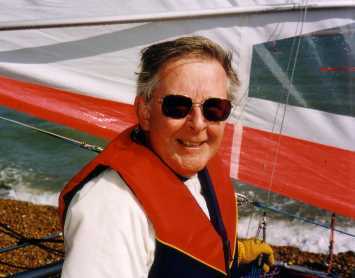 Typical of Jon, in his last few weeks , with his son Alex's help, because he was in a wheelchair, he had been preparing various tips to go on the class website, and his guidance on capsizing recovery was posted just a few days before he died. 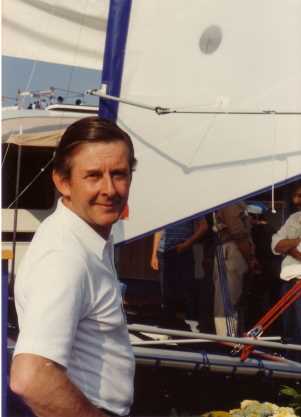 Jon was a remarkable man who had a vision for a unique catamaran that would become a design classic, which he took from the drawing board to reality on the water. We owe him a huge debt of gratitude for his vision, amazing expertise and dedication. 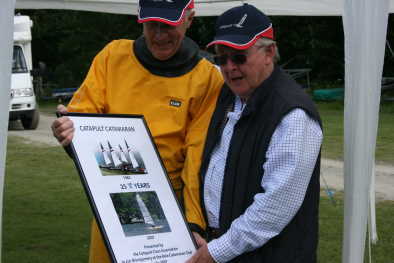 There was great admiration for Jon in the multihull world, not just for the Catapult as a longstanding part of catamaran sailing in the UK, but also for Jon's revolutionary Quatrefoil radio-controlled model catamaran that Jon had been campaigning very successfully, and which he hoped might one day be adopted by a syndicate and turned into a full size, ocean going, round-the-world record breaker. 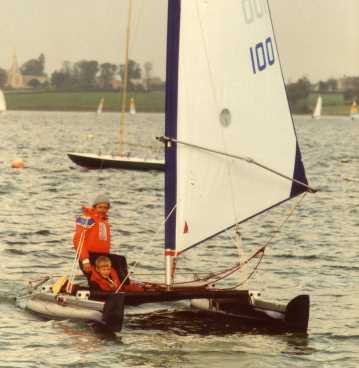 Above: Catapult takes to the water in 1982: Jon with son (and future Class Champion) Alex. The sympathies of all Association members go out to Alex and Sue.